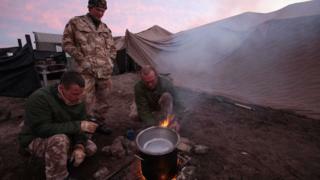 Excess Army food supplies should be given to the "army of the homeless", a senior MP says. More than 12,000 operational ration packs (ORPs) were thrown away between April and December - more than in the previous 12 months. Work and Pensions Select Committee chairman Frank Field wants these surplus packs to feed the UK's homeless population. The Ministry of Defence says it only disposes of ORPs "as a last resort". Labour MP Mr Field submitted a written parliamentary question to defence minister Harriett Baldwin, who in response said the Ministry of Defence (MoD) threw away 12,275 ORPs between April and December. During the whole of the 2015/16 financial year 10,798 ORPs were disposed of, and 5,004 in the year before that. Mr Field said the issue had been repeatedly raised by food banks, because of problems associated with catering for people who cannot cook or store food. And he said he was "staggered" by the amount of food packages the MoD throws away. "The number is going up and they're only destroying it. I just hope someone will look into it. Let's move it from one army to the army of the homeless," he said. "These supplies are designed for people, in a sense, to eat on the run, and people in doorways are in a similar position. "They're ideally constructed for when people haven't got much." Out-of-date ORPs are withdrawn from use and disposed of according to current food safety legislation, Ms Baldwin said. An MoD spokesman added: "Our stocks of ORPs are managed to make sure they are consumed within the two-year shelf life required to meet our food quality standards. "We only undertake disposal of ORP as a last resort and only at a point when the product can no longer be consumed. "Due to the changing nature of exercises or deployments, there will of course be occasions when ORP has not been issued before it becomes out of date." Reality Check: Did a million people use food banks? Why are people using Scottish food banks?